Sri Venkateswara University is conducting the AP EdCET 2018 on the behalf of the Andhra Pradesh Educational Common Entrance Examination. Candidates who are going to appear in the AP B.Ed Entrance Exam 2018 those candidates can able to download the notification from the official website. Once you can download the information brochure then first you need to check the AP EdCET 2018 Eligibility. If you are eligible then you can fill the AP EdCET 2018 Application Form through online mode. The university has also released the AP Ed.CET Syllabus 2018 & Pattern so you can prepare for the exam and get the good marks. As per updates, the university will schedule the exam in the month of April. Age Limit – Age of the candidates should be 19 years. The age relaxation will be given to candidates according to category wise for AP state candidate only. Education Qualification – Interested candidates can check the education requirement before filling the application form. If you have passed the B.Sc/ BE/ B.Com/ B.A/ BBM/ B.Tech then you are eligible for the written test and get the admission in the various colleges. Candidates must have at least 50% marks for General category and 40% marks for SC/ ST/ PWD Category. If your final year result is waiting or appearing in the exam then you can also eligible to apply. Candidates who are eligible they can fill the AP EdCET 2018 Online Form through the official website. Eligible candidates need to follow the guidelines for AP B.Ed admission. Application Fee – First candidates can visit the official website and click on AP Ed.CET 2018. Candidates can select the fee payment tab and make the payment through online mode such as AP Online by Cash or Debit/ Credit Card/ Net Banking. Now candidates can able to check know the payment status. Fill the Application Form – After making the payment, you can fill the application form. For this, you can select the tab of application and start filling the form. You can enter the personal, education and other details. Candidates can also upload the scan photograph and signature in the JPEG/ JPG format. Finally, you can submit the form for future reference. Finally, candidates can take a print out of it. Candidates need to know that the question will come from the General English, General Knowledge and Teaching Aptitude, Mathematics, Physical Sciences, Biological Sciences, Social Studies, and English subjects. Multiple choice questions will ask so you have to attempt all question within 2 hours. There will be 150 objective type questions. Each correct answer will carry 1 mark. There will be no negative marking. Candidates who have filled the application those candidates can download the admit card through the official website. Candidates can follow the steps and enter the Registration number/ Date of Birth (DOB) to download the AP Ed.CET Hall Ticket 2018. You can check the complete details about the exam such as Name, Center, Time of exam and instructions. Admit Card will be available in the month of April and appear in the exam. Once you will be given the exam after those candidates are totally worried about the result. So candidates who have appeared in the exam they can check the AP EdCET Result 2018. According to news, the result will be declared in May on its official website. Candidates must have to get the AP EdCET 2018 Qualifying Marks i.e. 25%. It means you need to get at least 37 marks out the total marks. There will be no qualifying marks if you belong to SC/ ST category. AP EDCET Results 2018 declared today at 12PM at sche.ap.gov.in. Andhra Pradesh B.ED Entrance Exam 2018 results. Candidates can get their AP EdCET 2018 result and rank card. 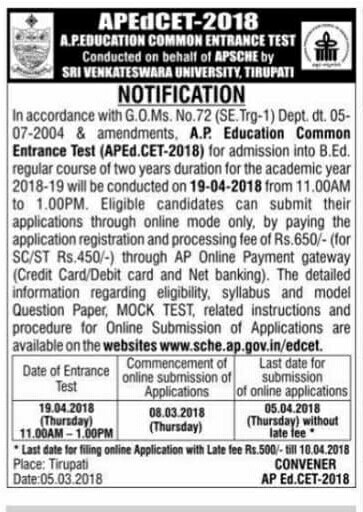 AP Education Common Entrance Test-2018 (AP Ed.CET-2018) will be conducted by the CONVENER, APEd.CET-2018, Andhra University, Visakhapatnam on behalf of the Andhra Pradesh State Council of Higher Education for admission in to B.Ed (Two years) Regular Course in the Colleges of Education in Andhra Pradesh State for the academic year 2018-2019. The qualifying marks in the Entrance Test for all candidates (except SC/ST) are 37 out of total marks (i.e. 25%). For the candidates belonging to SC/ST communities, there will be no qualifying marks for ranking. There will be no minimum qualifying marks for women in Physical Sciences/Mathematics methodologies. Browse for “AP EDCET Results 2018” Link. Enter your Hall ticket number. Click on Submit. Your AP Edcet results are displayed. The final step of admission will be counselling. So counselling will be starting from June to July within three rounds. Candidates will call for the counselling according to rank wise. Candidates must have to check the counselling procedure and make the payment Rs.1000/ – for Gen & Rs.500/ – for SC/ ST Category. You can fill the web option during the registration and lock it carefully. After that, you will able to get the AP EdCET 2018 Seat Allotment Result and download it. Now candidates can report at the institute along with original and Xerox copy of documents. Counselling fee will be nonrefundable.